FREEBIE!! Hello Back to School!! Hello Fall!! Hello Apple Season!! This precious simple brand new song celebrates apples, applesauce, and this sweet, delicious fruit that we absolutely cannot get enough of when the fall rolls around. This song would perfectly compliment any apple unit or any Fall, Autumn, or Harvest Concert, especially for students in Pre-K through 2nd grade. One Arts Infusion Collaborative seeks to create original music and other creative resources that enhance curricular content, celebrate holidays, and engage imaginations. 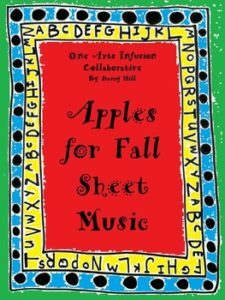 Apples for Fall Sheet Music by Darcy Hill is licensed under a Creative Commons Attribution-NonCommercial-NoDerivatives 4.0 International License.